Is it time we scrapped that cap? How to haul your grain to the U.S. Here in the brave new post-single desk world I hear a lot of curious chatter from farmers thinking about hauling their own wheat and barley to the United States. 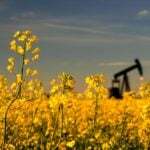 Of course, Canadian pulse and oilseed producers have always been allowed to sell their production to the U.S. so this is not entirely uncharted territory. Other farmers jumped into cross border grain movement full-force since August 2012. I tapped into the available expertise to answer some questions farmers may have before they cross the line. Landon Friesen farms with his brother and father at Crystal City, Man. — a mere nine miles from the North Dakota border. They have hauled hay steadily to U.S. dairies since 1995, but began hauling wheat, soybeans and canola there as well in 2012. “In North Dakota there are elevators everywhere, so the marketing opportunities are huge,” said Friesen. It takes him the same amount of time to haul a load of grain to the closest North Dakota elevator as it does to the nearest Canadian one. He now hauls about 90 per cent of his grain to the U.S. Convenience isn’t the only reason Friesen hauls to the U.S.; he finds grain grading more favourable stateside. “When I take a grain sample to my local elevator they’re nailing us for mildew and things they don’t have to,” said Friesen. “In the U.S. they don’t seem to be so particular in the grading room, less dockages and better grades.” Friesen mentioned that his wheat samples are tested for protein, moisture and falling numbers, a measure of the amount of sprout damage in cereals. 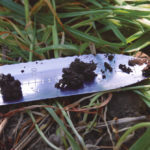 Many farmers see protein, moisture and falling numbers as more objective and fair assessments of a sample’s milling performance than the Canadian visual grading system. Chris Herrnbock, a farmer at St. Gregor, Sask., is one of those farmers. Herrnbock, like Friesen, hauls his own grain to the U.S. and also hauls grain south for his neighbours. 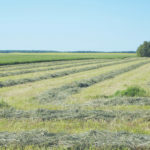 Despite being about 400 kilometres from the border, Herrnbock said all of his oats, as well as about 80 per cent of his wheat and half of his peas will be sold into the States this year. Problematic grain movement has been a big factor pushing both Friesen and Herrbock to go south with their grain. When we talked in mid-February, Friesen moved his February contracts to a North Dakota elevator in December and now he was working on March contracts. “It seems they can always take grain,” said Friesen. By the end of March 2014, when much of the western Canadian harvest was still land-locked and the federal government had mandated minimum grain movement by rail, Herrnbock managed to empty his bins by hauling into the States. Hauling oats to Iowa was pretty extreme, he said, but with American millers desperate for oats, it paid for him to drive to Cedar Rapids. 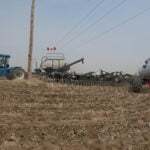 This year, Herrnbock said, he is 11 weeks behind on hauling his locally contracted canola. Peas that he had contracted for movement in September 2014 were still sitting in his bin in February, but he was trying to get out of those contracts so he could move them south. He’s also busy hauling “for-hire” as the U.S. Department of Transportation (DOT) refers to commercial truckers. Most winters Herrnbock works in the oilfield, but this year he suspected he would be hauling grain for neighbours. Farmers might be asking themselves, how eager are U.S. grain buyers to accept Canadian grown commodities? I’m sure the answer varies by location and product, but some companies are expanding their facilities for the express purpose of capturing the increased flow of grain from north to south. One such company is Columbia Grain. I heard a while back that they were expanding their facility at Sweet Grass, Montana, which intrigued me as there’s not a lot of grain production in that area of Montana. Jeff VanPevenage, senior vice president of Columbia Grain, acknowledged that that area of Montana is “mostly cattle country,” but he pointed out that, all things being equal, there’s a 35-40 mile radius of grain production in Alberta that should come to Sweet Grass rather than Lethbridge, based on proximity alone. VanPevenage estimates that 60 to 65 per cent of the grain handled at Sweet Grass now comes from Canada. “We wouldn’t have done it if we hadn’t seen the Canadian potential,” VanPevenage said of the expansion. Canadian grain also motivated expansions at Columbia’s facilities at Plentywood and near the Port of Turner. VanPevenage encouraged farmers interested in selling grain into the U.S. to bring or send their samples to a U.S. grain lab for official grading and then have a discussion with the buyer about price. Many grain buyers list their prices online, but an actual contracted price based on each sample’s specifications should be agreed on before farmers send their grain south. “We handled a lot of durum this year and we did it grower by grower,” said VanPevenage. “It’s been an education for growers to figure out how our grading system works. I asked Friesen and Herrbock if they ever saw different prices posted at U.S. elevators for Canadian grain. They both said sometimes, but not always. VanPevenage said they do post a different price for grain of Canadian origin and it’s generally lower. Reading between the lines, I believe the price differential might be the result of the commodity’s final destination. VanPevenage explained that generally U.S. and Canadian grain can not be co-mingled in shipments bound for export. 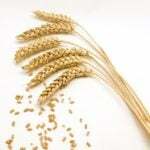 Some countries have different testing standards for grain originating from different countries. The cost of keeping the two streams of grain separate lowers the value of Canadian grain in the U.S. system. I suspect in the cases where the price posted for Canadian grain is the same as American grain, the end user is a domestic processor and they see Canadian grain as equal in quality to that produced in the U.S. All this to say, don’t be surprised if you come across a different price for Canadian grain, but don’t take it as a given. The first step is to obtain a DOT number, which is required for all vehicles or combination of vehicles over 10,001 pounds. A DOT number is free but requires a credit card number for identity verification. No surprise, once you have a DOT number, both driver and vehicle are subject to DOT’s regulations, so make sure to read up on those. As in Canada, farm plates are acceptable if you are only hauling your own grain. However, you will still be considered a commercial vehicle on U.S. roadways. Drivers need to keep a log book and observe hours of service limitations. (There might be some exceptions to the log book requirement if you are within a certain radius of home). Dyed fuel is not allowed on U.S. highways. Your vehicle will also have to be able to pass U.S. DOT safety inspections; drivers just starting to haul to the States can expect to have an inspector go through their truck and log books at least once during the first year. “You’re going to get scaled, so make sure your weight distribution is correct,” said Herrnbock. While axle weight restrictions vary by state, 80,000 lbs. gross weight is the maximum on all interstates (without an overweight permit). A tandem trailer works in all jurisdictions and super-B configurations are generally not allowed, except within a short distance from the border in some Northern states. For his loads into North Dakota, Friesen added a pusher axle (a non-driving axles that goes in front of the tandem driving axles) to his semi and along with his tridem trailer he will be able to haul 105,000 pounds year round. All carriers traveling in more than one state or province need to apply for membership in the International Fuel Tax Agreement (IFTA). Depending on your home province, this will cost $15 to 65 for the company each year and $4 to $10 per truck. Carriers must report the number of kilometres driven in each province and state and the litres of fuel purchased in each jurisdiction. Since road taxes are embedded in fuel purchases, this program is meant to ensure that taxes are paid proportionately to the road usage in each area. Each state and province has a different rate of taxation, so carriers could end up owing money or getting a refund depending on the scenario. For example, since Alberta taxes diesel fuel at $0.09 per litre and Saskatchewan’s rate is $0.15 cents per litre, if a driver bought all his fuel in Saskatchewan, but did all or most of his driving in Alberta, then he would get a refund. The opposite mean the operator owes money. Anyone operating a commercial vehicle in the U.S. must also be enrolled in a random drug and alcohol testing program (read: pee in a cup). I spoke with Dr. Barry Kurtzer, medical director of DriverCheck Inc., a company that provides a range of medical testing services. According to Dr. Kurtzer, companies must create a drug and alcohol policy, provide supervisor and employee training and finally, provide testing for drivers. The testing step is not meant to be “punitive or a witch hunt” said Kurtzer. Drivers must be pre-screened and pass a urine test before they are allowed to drive on U.S. roadways. Then they are entered into a random testing program, which requires them to give a sample at an accredited collection site on short notice. According to DriverCheck communications co-ordinator, Sherry Morley, individual drivers are not normally asked to present proof of testing, but the DOT does audit companies for compliance on driver testing. “Employers must keep accurate testing and random program enrolment records, must provide testing statistics to DOT upon request, and must provide actual individual testing records on demand as required under DOT testing regulations,” Morley wrote in an email. For a fee, DriverCheck can provide companies with a policy manual template and online or in-person supervisor training. Once your truck, driver, and fuel taxation requirements are met and you’ve delivered samples to U.S. grain buyers and agreed upon terms, the next step is customs brokerage. When commercial goods move across borders, governments want to know about it. Customs brokers are licensed by the government to act as a communication agent between exporters, importers and their respective governments. Harry Wood II is president of International Trade Solutions (ITS), a North Dakota based customs broker that has been facilitating international trade for four generations. “The primary services of a customs broker are that we help guide the exporter in compliance matters, keep the processes quick and easy, and train exporters on best practices used industry-wide to efficiently move shipments to the U.S., Canada, and elsewhere,” explained Wood. A shipment of grain going into the U.S. must be properly reported to U.S. customs, the United States Department of Agriculture and the Food and Drug Administration (FDA). Mistakes on commercial entry are costly — around $10,000 at customs and up to three times the value of the shipment if handled incorrectly with the FDA. Customs brokers like ITS help shippers avoid these expensive mistakes. For $500 per year they can provide exporters with a continuous bond, which is required by the U.S. government and ensures that if mistakes are made in the shipping process the government can collect any fines levied. It can take up to two weeks to receive the continuous bond but after that, exporters can proceed with shipments as long as they provide two hours prior notice to the FDA and one hour pre-arrival notice to customs. Wood’s company provides a computer program that allows shippers to fill in their customs, FDA and electronic manifest documents on one interface. ITS then sends the information to the governing bodies, calling shippers if any issues arise that would delay entry at the border. All imports of commercial goods must be reported to the U.S. government agencies with actual weights and values, which most shippers won’t have until the grain is delivered, unloaded and graded. To accommodate the delay between border crossing and final weights, exporters are allowed to submit prior notice and cross the border with estimated weights and values. Wood explained that their computer software allows people to go back and change the estimated units to actual ones when known. Wood said 98 per cent of the paperwork can be processed in 10 minutes, but he encourages shippers to submit their documents a couple days early to ensure the smooth flow of goods and reduce FDA delays. “If you have a shipment that’s going across on Friday, get us the information to submit the paperwork to the FDA by Tuesday and then they have a few days to review the information,” said Wood. Wood wouldn’t say how much an individual shipment would cost someone exporting grain. Rates are “based on the time we spend to file entries and make sure they’re compliant,” he explained. When I asked Chris Herrnbock and Landon Friesen about the cost for bringing a load across the border their answers were between $45 and $60 per load. While the costs aren’t enormous, the paperwork can seem daunting. Wood said some producers may still find it in their commercial best interest to sell to a Canadian grain handler, but the import requirements shouldn’t deter farmers from exporting their own grain. “For commercial trade, the border has never been easier to cross. If you get your profile set up and do your paperwork in advance, average booth time at the border is 40 seconds,” he said. For Friesen, the upfront costs are enough that he doesn’t see this as a venture to jump in and out of. When Herrnbock compares prices locally and in the U.S., he figures he needs to make $1.20 per bushel more just to cover the costs associated with hauling south. Given the current exchange rate that amounts to a $1 difference between the U.S. and Canadian posted prices. 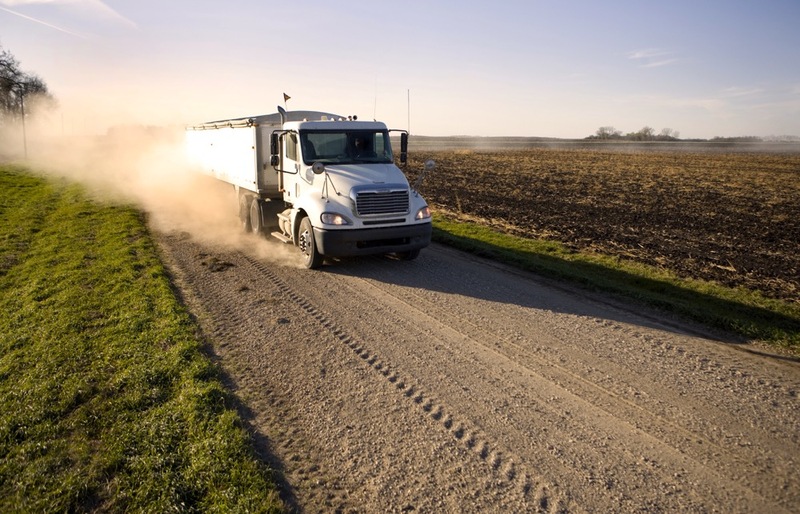 For farmers who don’t have the inclination or equipment to haul State-side themselves, a bonded trucking company can take care of much of the paperwork and all of the miles. Staying informed of the options and costs in marketing, however, are responsibilities now in the hands of producers — embrace them. Herrnbock said if you don’t have an international cell roaming plan, turn off your data when you go to the States. Manage currency exchange. Herrnbock has a U.S. chequing account for grain payments and a U.S. Visa to buy fuel or other goods in the U.S. He uses the U.S. chequing account to pay off the Visa and limit the number of times he loses money on the exchange. Friesen has a U.S. funds chequing account at his Canadian bank, but uses a money exchange company to exchange funds. He can already lock in exchange rates for the 2015 crop year. Make sure you or your drivers have adequate personal health insurance and that you have appropriate liability on your trucks. To get a DOT number, visit www.dot.gov for its page on Motor Carriers. For International Fuel Tax Agreement information: Google your home province + IFTA. Sarah Weigum grows pedigreed seed and writes at Three Hills, Alta.